Though it’s located just 22 miles off the coast of Los Angeles, Catalina Island feels like a world away. Whether you’re looking for a fun day trip or romantic weekend escape, this hidden gem of the Pacific offers endless outdoor adventure, natural wonders and plenty of options to simply relax and unwind. There are many reasons to fall in love with Catalina Island, so consider this your introduction. With so many fun things to do, it’s the perfect excuse to visit again and again! 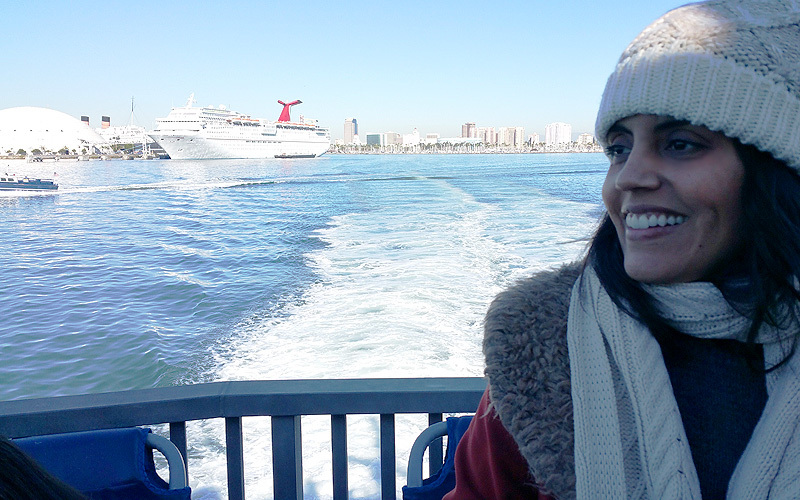 Before your trip begins, the best way to get to the island is Catalina Express. This fleet of high-speed vessels will take you from the mainland – there are ports in Long Beach, Dana Point and San Pedro – to the island in about an hour and oh what a fun ride it is! Just being out on the water is refreshing and if you’re lucky, you’ll see dolphins. If you can, upgrade to the Commodore’s Lounge for an extra $15 — not only will you get to board the boat before everyone else, but you’ll have VIP access to the top indoor deck and get a free drink. The heart of Catalina Island, Avalon is a town that makes you feel as though you’ve stepped back to a simpler place and time. Just walking along the stretch of shops and cafes is a welcome escape from the hustle and bustle of the big city. 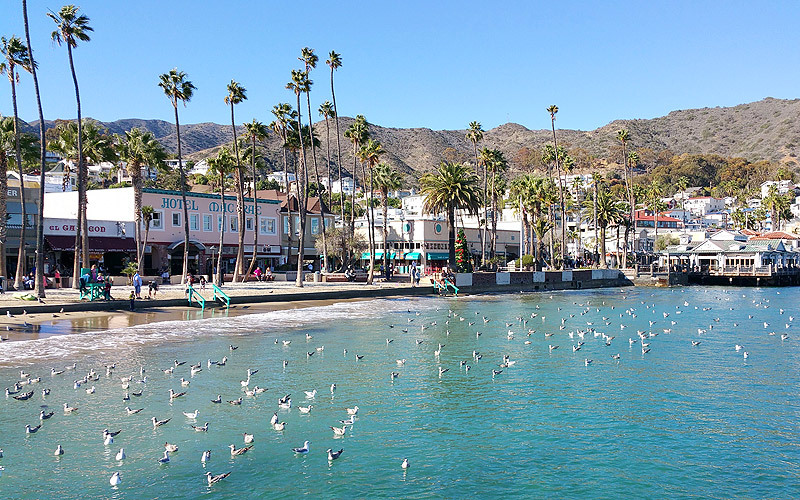 Whether it’s the pier or the bay or the little side streets, this charming center of Catalina is a huge part of the island’s charm. Golf carts, golf carts, everywhere a golf cart! One of the most popular things to do in Avalon is rent one of these fun little rides to get around the island. 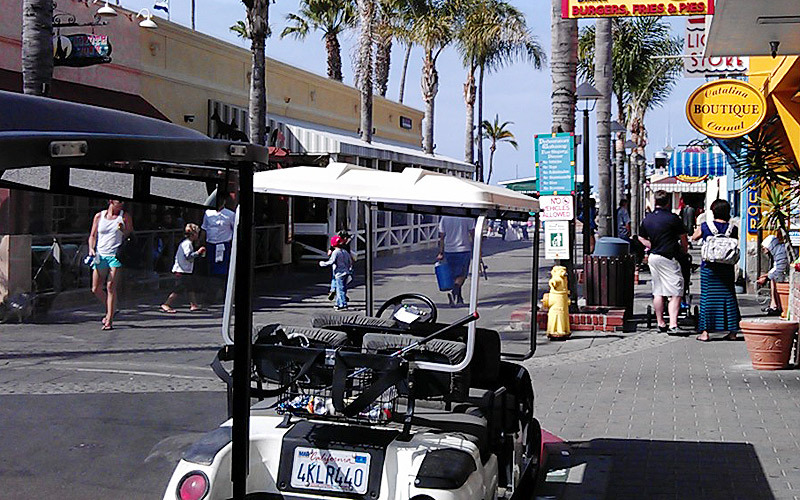 Since it’s pretty much impossible to get car permits on Catalina (it’s one of the reasons this island is so charming), golf carts will be your main mode of transportation. You can rent a four- or six-passenger cart to explore and discover at your leisure. No required routes, just your sense of adventure and imagination. 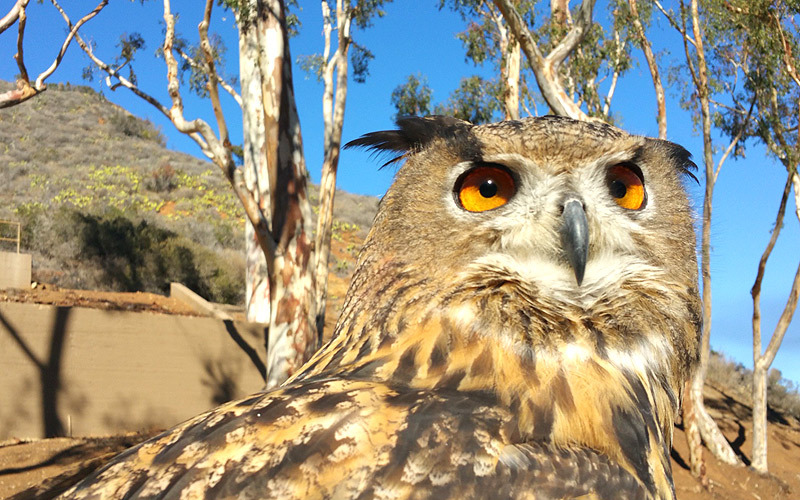 Whether you’re nine or 91, one of the most memorable activities you can do on the island is the Catalina Falconry Experience. This is your chance to get up close to some of the coolest birds of prey who keep the pesky seagulls away without actually killing them. You can take a lesson on how to hold and call a hawk to your glove and meet & greet an owl. Make sure to take pictures because there’s a good chance you won’t believe your eyes. Head up the very steep hill to this one-of-kind guesthouse and you’ll be rewarded with the most stunning views overlooking the Avalon Bay. Once the home of William Wrigley Jr. and his wife Ada, this six-bedroom inn is perched nearly 400 feet above the Pacific Ocean. (You can even see the baseball field down below where the Chicago Cubs would practice back when Wrigley owned the team.) Just walking through the living room and property feels like stepping back in time and the staff is more than happy to tell you about its history. For the ultimate experience, book a room and you’ll probably never want to leave. But even if you’re not staying here, you can make a lunch reservation and dine on the patio or in the main dining room. The views and the food will surpass your expectations. 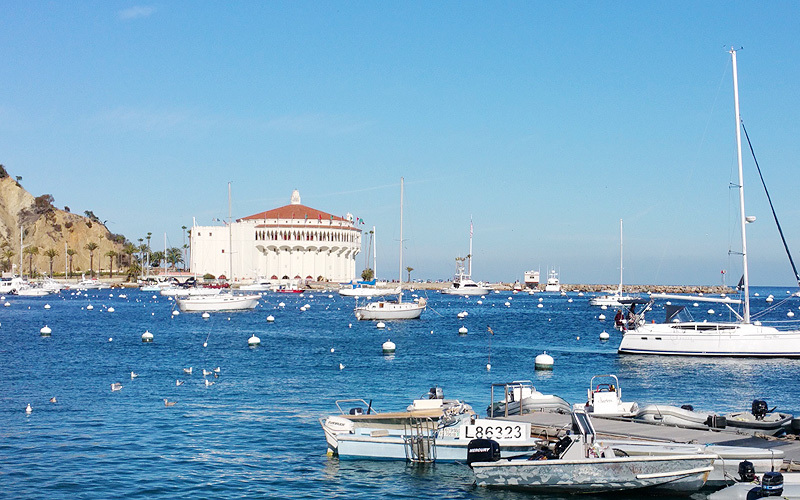 Catalina Island is ideal for day trips, but do yourself a favor and stay overnight. 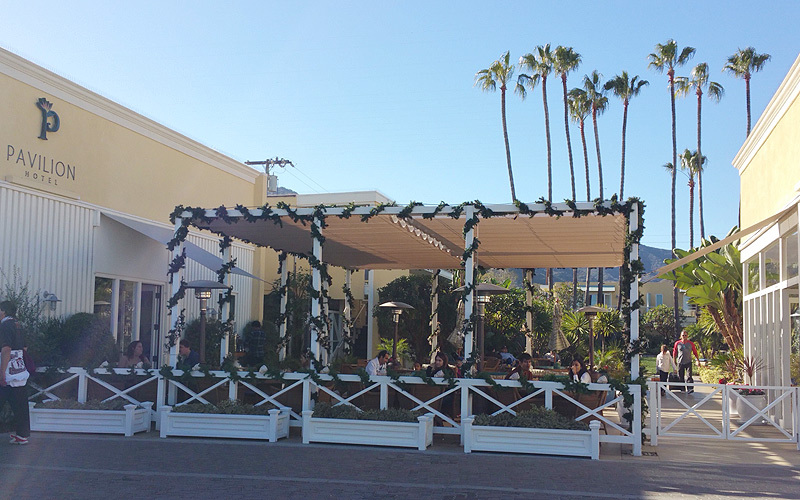 The Pavilion Hotel is located right in the center of Avalon, the island’s charming town lined with shops and cafes. Recently redesigned, the Pavilion Hotel is an intimate retreat with casual-chic rooms (get a suite with views looking out to the Pacific if you can), beautifully landscaped tropical gardens, a large outdoor fire ring and laidback courtyard lanais with views of the ocean and sidewalk action. Even better, complimentary breakfast and daily wine and cheese tastings are part of your stay. 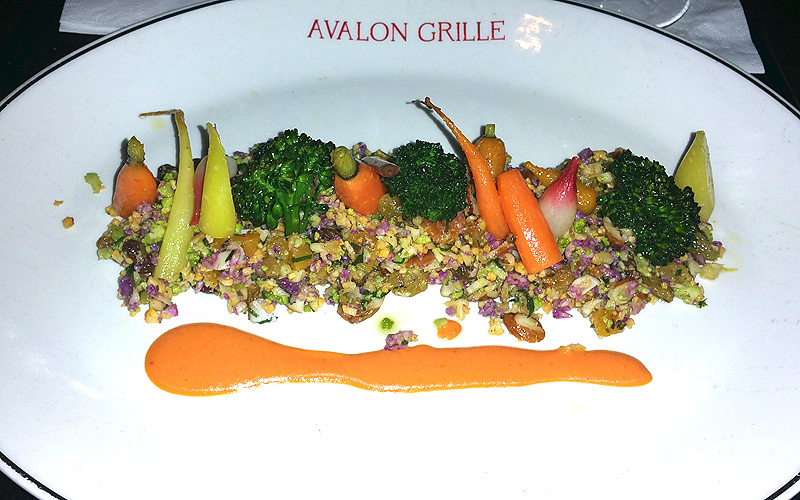 The hottest dining and drinking spot in town, the Avalon Grille not only has a fun bar scene, but the food is beyond what most people would expect. (Translation: It’s not a culinary tourist trap.) Focusing on seasonal American cuisine, dishes include everything from gourmet burgers to fresh seafood. For those with dietary restrictions (vegan, for example), the chef and crew will do everything they can to accommodate you. If you let them know in advance, even better. Sit by one of the large windows overlooking Avalon Bay or on a warm day, sit in the open-air patio and make sure to have one of their killer cocktails. When you want a little luxe relaxation, hit up Descanso Beach Club. Rent a cabana, lounge on a chaise right on the sand and enjoy a seaside drink (or two) along with top-notch food. 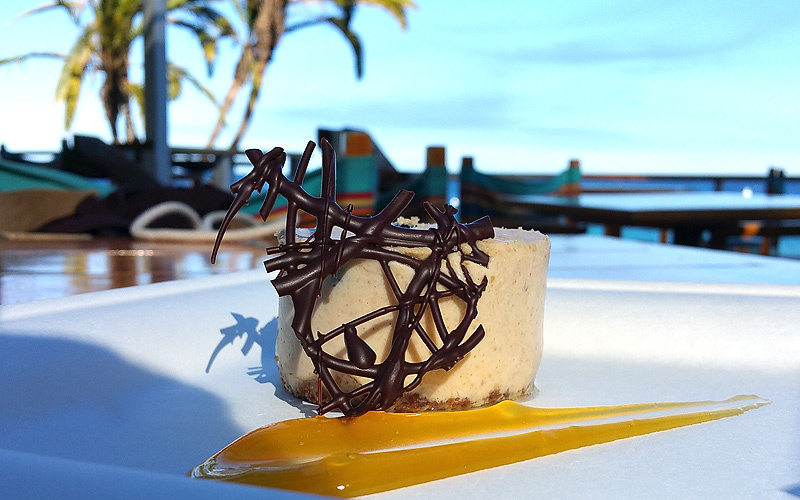 The open-air restaurant is a perfect spot to grab lunch with some of the best ocean views around. 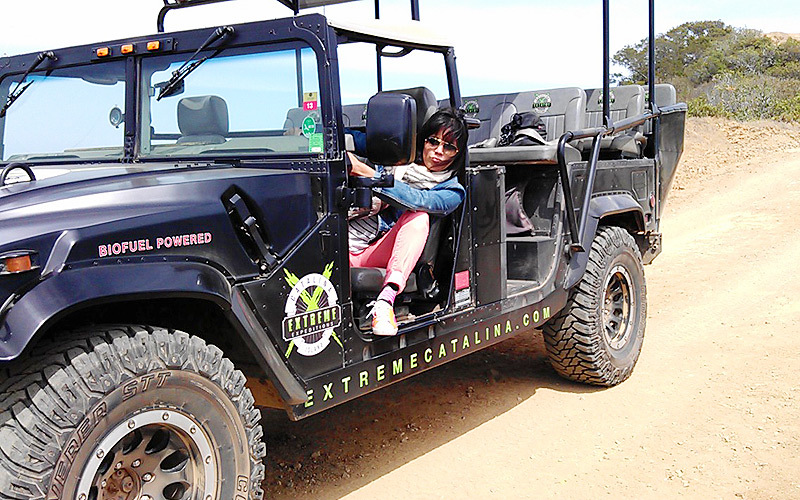 Last but not least, one of the most adventurous, fun and unforgettable things you can do while on Catalina Island is to get on board an open-air, biofuel Hummer and take a two-hour tour to the summit above Avalon. Your driver will tear through five miles up rugged interior terrain where you just might see some of the island’s famed buffalo (on my trip I had to settle for bison dung! ), insane views of the coastline and a serious trip down the deep canyons below. I have an 8 year old boy, 12 yr old girl and 19 yrs old son any suggestions? Thanks for a very descriptive article on this island. We are planning to visit in Aug of this year. How many days do you think we need to explore the island? Is there enough to do for a 15 yr old boy? Thanks for taking the time to read my article. I’m actually going to be updating it with a couple more recommendations. 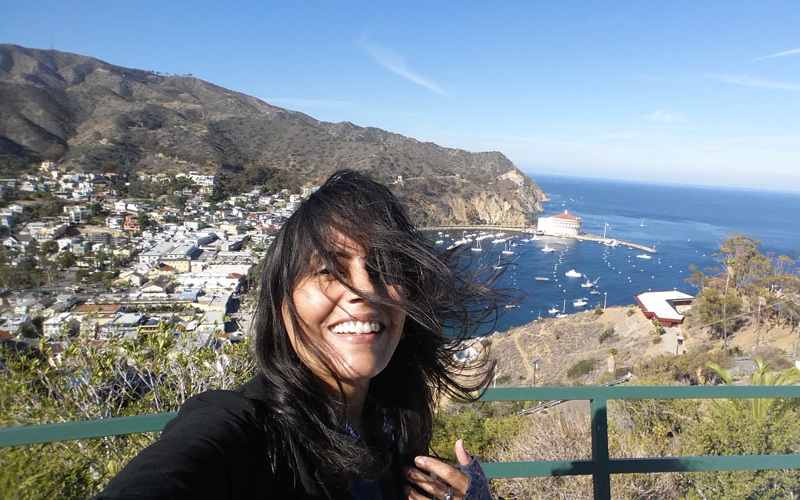 I’ve been to Catalina a total of four times and I’d say you don’t need more than two or three days to see and do everything you want. Definitely rent a golf cart at least one day, go on a Hummer tour and make sure to have lunch at the Inn at Mt Ada. It’s a little pricey, but it’s so worth it for the views and to enjoy the property. The food is also top-notch. You can also go scuba diving if your son enjoys that — I never have, but people really enjoy it. There’s also a zipline more inland. If you’re into spa stuff, I would also suggest the Island Spa – my husband and I booked a treatment last summer for his birthday and it was fantastic because you can use the pool and relax on the upper deck with views of the harbor. Enjoy! Do you guys do the ride on birthday for free still!? Unfortunately, Catalina Express stopped doing the free birthday rides at the end of 2017. Hopefully they bring it back!